Is it summer time yet? It must be around the corner because lately I have been in the mood for icy cold sweet treats. Last week we went a little ice cream crazy with this recipe and also indulging in some delicious local ice cream. And this week I’m branching out to popsicles. Well, not just popsicles. These are creamsicles. I think normally if someone was like, “Hey would you like to try some milk in your orange?” I would think: 1.) Who goes around offering up milk to people’s beverages? Is that a job? I want that job. 2.) No. Gross. Milk and orange aren’t a thing. But actually they totally are. Orange creamsicles are the BEST and conjure up childhood food memories. 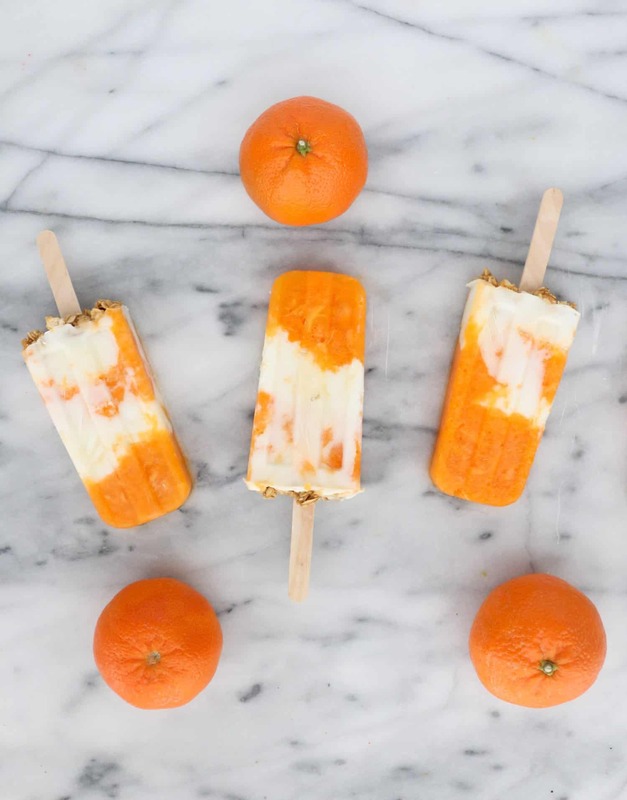 Orange Creamsicles, make 8 standard size popsicles (may vary based on your mold size). First extract the juice from the oranges. If you're too busy and important to stand around juicing oranges, you can use store bought orange juice. Blend together the orange juice, ice cream and zest until smooth. Pour into popsicle molds, but leave the top 1/4 empty. Using a whisk, or a stand mixer with a whisk attachement whip the heavy whipping cream until soft peaks form. You don't want firm whipped cream, just firm enough that it won't too quickly seep into another liquid. Spoon the whipped cream on top of the creamsicles, add popsicle sticks and freeze overnight. Emma your writing style is just hilarious. You make me laugh so much! OH and these creamsicles look freaking delicious. What kind of popscicle mold do you use? Can you post a link? I love this shape and am having the hardest time finding a good mold! Looking very yummy! I can’t wait for summer. My favorite thing to photograph is anything any of my three daughters is doing. They are my finest creations. I would love to win an iPad Mini. I love your blog. God they look good, I’m pregnant and can not get enough of anything that’s frozen right now! What! Yes! These look delicious! And I just pulled out my popsicle maker again, haven’t used it in quite a few months. I must make these! I used to eat so many of these when i was younger! Would love to make them myself sometime and the one with grapefruit seems delicious too! Thanks for sharing. Lovely photos! Adorable! I just love these. And I’d watch Star Trek. But that’s just me. Oh man! It’s been sweltering hot here in FL so a creamsicle would be PERFECT right about now!! Yum!! Brings me back to my childhood! You guys always have such good recipes!! love them!! Happy Friday!! Yay! Creamsicles for summer! Thanks for the recipe! My fiance loves these! Have a wonderful weekend. Ha! Just went to Amazon and ordered a Popsicle mold!!! Oooh I would like to add vanilla vodka! Happy Summertime! hahaha! Your writing is too funny. But it’s true! In theory it sounds nasty. Great recipe though! I’ll absolutely be trying it! These look absolutely amazing, and I would LOVE to try this recipe with other flavors too! I can’t wait… but first things first, I need a popsicle mold! Those look delicious! I love the way they are kinda ombre. I’ve been drinking milk w/orange juice (+ 2 tablespoons of sugar) since I was a child. Hubby finds it groooossss; and me delicious. Funny though that he does like store bought creamsicle. Thanks for the recipe. Your witty comments crack me up! 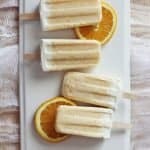 I was scouring the interwebs just the other day to find a good creamsicle recipe. Thanks so much for sharing! Man, I should have asked for popsicle molds for my birthday! This sounds like a great recipe to try once it gets warmer outside! These look great! Thanks for the instructions! Wow these are so beautiful. What a perfect early summer recipe! BUT, this recipe sounds great! I can’t wait to try it. I also can’t wait for the next time I am in Springfield so that I can try Elle’s. Those look divine and SO refreshing. Mus try this summer! Thank you for this receipe! Going on a small trip tomorrow and I have Game of Thrones Season 1 and 2 on my Tablet ready to devour it!! Icecream and Game of Thrones – can’t get better than that! YUM! I’m trying these for defs! BRILLIANT. I love creamsicles. Did you add any sugar to the whipped cream, or was it enough by itself? Oooh, another must make for this summer!! Thanks!! Wow! These look great.. i might experiment with some lime ones! Homemade popsicles are my favourite! You can literally do whatever you want! Those look super delish. I recently made a basil lime popsicle. Yum! So funny I’ve never dissected one to think it had milk and orange together. So gross. But hello amazing!! Omg these look amazing. The citrus flavor of oranges blend magnificently with the creaminess. As a kid, I loved the orange Popsicles with the vanilla ice cream in the middle. Regular oranges seem great too, but I can imagine how they would taste using blood orange. YUM!! These looks freaking delicious and FRESH. Mmmmm. Tummy cravings! These look so fresh and delicious! A great summer treat! This makes me want summer more than ever. those look sooo tasty! and sound simple enough that i actually might try and make them! Mmmmmmm, these look incredible!!! I need to make these! #Pinning! Yum!!! Definitely making these for the kids (and ME) when the weather gets a bit warmer over here. Yum!! Pining this for when it’s summer here in New Zealand. So yummy, fresh and light. I can’t wait to try them! I so want to eat these. You girls are killing me. mmm… that looks delicious! If Summer decides to come to Germany (i highly doubt it, but still) I’m going to prepare these beuties. Now that I think about it, I’m going to prepare them anyway! Screw you, German weather!!! I would love to try this so badly! Sadly, I have allergy for oranges;( I looove unexpected combinations! A little bit of fresh ginger in creme brulee are also a great one! Cost Plus or World Market is Promoting Popsicle recipes, and molds lately. I tried the juice from California navel oranges with some sugar and heavy cream. Tastes very good too. It’s allergy season here so extra vitamin C on a sore throat is helpful. These creamsicles look really good! And your writing is so funny ;). YUM! yumyumyum. I made grapefruit creamsicles a few months back and they were divine. I’ll have to give these a try! Creamsicles and Game of Thrones!! You know everything I like. I love it when things are just simple and perfect. I’m going to be on the lookout for Popsicle molds. No way. I was seriously just Googling creamsicle recipes two days ago. Great minds think alike. 😀 I can’t wait to try yours! This is such a good idea! Thank you for the recipe! Can’t wait to use it for the summer. These look SO FREAKING GOOD and I can’t wait to try them for summer! I’m going to try them with maybe some sort of strawberry juice! Yum!! Can’t wait to try these! I made these once and accidentally found that if you pour in the cream when the inside of the popsicles are liquidy but the outside is frozen, it sort of sinks and fills in the centers like store-bought creamsicles. My sister and I made these today! We took your advice and are freezing them overnight but I cannot wait to taste them tomorrow. We will definitely be taking photos and editing them with your “A Beautiful Mess” iPhone app which we are both loving. The process was so fun and simple, we shared many giggles and enjoyed every aspect from purchasing ingredients to blending the flavours . Unfortunately we only had 6 popsicle moulds so with the rest, we frozen them in a “mini muffin” pan. Nobody can deny how pretty they are! Thanks for sharing Emma! Would love to win an i Pad mini to take photos of my baby girl, Viva Wilde!